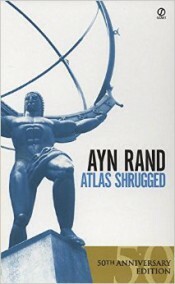 Overview (No Spoilers): Atlas Shrugged is long-winded, with an obvious political agenda, however Rand weaves a suspenseful story, which includes a passionate love story, mystifying disappearances, and unfinished, intriguing feats of engineering. Dagny, an heir of a railroad dynasty, and Hank Rearden, a self-made steel tycoon, struggle unrelenting against competitors, their families, government regulations, and other unknown enemies threatening to destroy their respective companies. Once you become accustom to Rand’s excessive elaborations the story develops into gripping journey during an industrial turning-point either toward destruction or revolution. Be forewarned there is a 70 page speech (or 4 hours in audiobook time) toward the end of the book which essentially rehashes the political points previously addressed throughout the book. Overall, I understand why Atlas Shrugged, is considered a classic and thoroughly enjoyed the book once I became acclimated to the writing style. Additional Insight (May contain spoilers): I’m currently in the midst of training for a half marathon and to pass the time I have begun listening to audiobooks during my long runs. Finding running not particularly enjoyable, getting lost in a book helps pass the monotony of running. To be honest I listened to Atlas Shrugged as an audiobook, which lead me to debate as to whether or not I could fairly review this work of literature, due to deviating from the intended purpose of reading the material. Would I be cheating the books I had held in my hand (Kindle or actual books) by critiquing a book I had spent over 60 hours listening to? Would it be fair to the audiobook if I found the narrators voice grating or soothing? After some pondering I’ve added an additional designation (medium) after the rating to denote the how I had absorbed that particular work of literature. So, as analytical chemists, I take it you appreciate precision and rigor of thought? I’m a sort of chemist by profession as well, and I have a blog that focuses on the philosophy behind Ayn Rand’s novels. In my blog, I bring as much rigor and precision as I can muster to explanations of, and arguments for, Ayn Rand’s philosophy. If you’re interested, my blog is: Objectivism for Intellectuals. I recommend starting with the “Introduction to Objectivism” page.